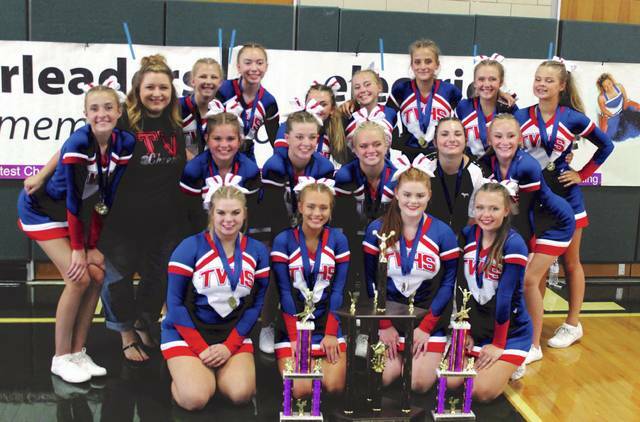 Tri-Village was named the Grand Champion of the 2018 Darke County Fair Cheer Competition on Friday. It is the second year in a row for the Patriots to be crowned grand champion. GREENVILLE – The Cheer Competition was among the first events to open the 2018 Darke County Fair on Friday, but due to weather concerns, the competition did not take place on the fairgrounds. Instead, it was moved to the Greenville High School gymnasium, but whether it was at GHS or the fairgrounds did not matter as Tri-Village again dominated the event by winning every category except junior high cheer to claim its second consecutive overall grand champion award. Tri-Village took first place in the Pee Wee Dance, Pee Wee Cheer, Junior High Dance, Varsity Cheer and Varsity Dance categories en route to capturing the overall Grand Champion. The Patriots also were given the Spirit Award. Ansonia won the Junior High Cheer category and the individual cheer winners were Mekedes Bush (Jr. High) and Holly Sader (High school). Runners-up in each of the team categories were as follows: Greenville Youth (Pee Wee Dance), Darke County Elite (Pee Wee Cheer), Ansonia (Junior High Dance), Greenville (Junior High Cheer), Covington (Varsity Cheer) and Mississinawa Valley (Varsity Dance). This entry was tagged Cheerleading, Darke County Fair, Tri-Village Patriots. Bookmark the permalink.